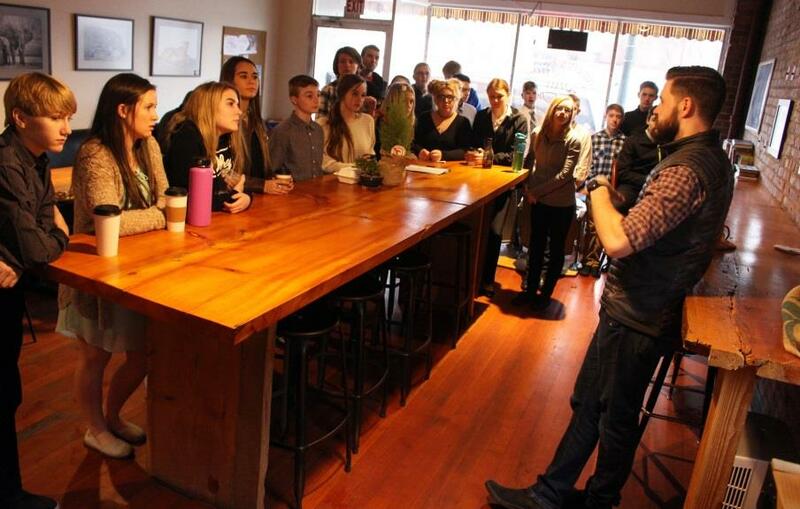 Henley High School students learned what it takes to start a business in the real world when they toured downtown coffees shops, outdoor stores and restaurants. “It’s really important kids understand the value of local business,” said Henley business teacher Luke Ovgard. “They see just how much goes into building and developing a local business. And I think it gives them a little more appreciation for that latte they grab down the street.” About 50 students spent the day touring downtown, learning from business owners. Then they presented business and product plans to panels of judges. Mike Angeli, who presented to students at his outdoor store, The Ledge, and judged presentations, said he believes an experience like this can change a young person’s perspective. The students toured and presented in two 25-student groups. They visited: The Ledge Outdoor Store, Klamath Basin Sports, A Leap of Taste, The Daily Bagel, Rodeos Pizza & Saladeria, Gathering Grounds Café & Roastery and Gaucho Collective. Some students learned about businesses they didn’t know existed downtown. “I didn’t know there were so many coffee shops here,” said Jasmyne Baylie, 15, a freshman business student who is also in DECA. Others were surprised by the ways some Klamath businesses are ahead of the game. Students put those lessons to work in giving their business proposals to a panel of judges. They presented PowerPoint presentations and judges gave feedback, similar to the show Shark Tank. The program of touring businesses and presenting proposals was developed last school year by Sergio Cisneros, business teacher at Mazama. It is spreading throughout the Klamath County School District for all Introduction to Business classes.